TRANSPORT THEM IN STYLE – BABY SKATES TOTE BAG – MUST HAVE! Transport your BABY SKATES in style with our canvas BABY SKATES Tote Bag. Our tote bag measures (11”wide x 9½”high) and is gusseted (3 ½”wide) to sit flat and hold your skates. Made in the USA ! Machine washable and can be put into the dryer. 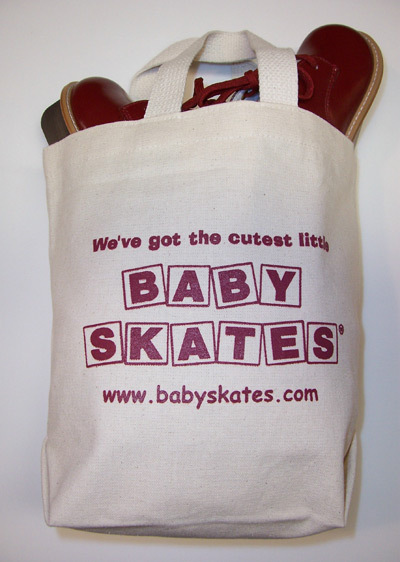 Now that you have your BABY SKATES - protect them with our BABY SKATES Tote Bag. Sized perfectly for your little ones! COLOR - Soft natural canvas (off white) tote bag; with our BABY SKATES logo screened on both sides – colors of logo vary.